You need to copy/paste the link. 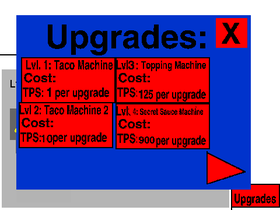 Brand new game coming your way- Taco Clicker: The Ultimate Factory! NOW WITH REBIRTH, SAVE SYSTEM, UPGRADE DESIGN, BEGINNING AND END COMIC STRIPS, AND MUCH, MUCH MORE! Can We Get 200 Managers by February? Post your top 3 most popular projects here!